Will Nifty Sustain above 8000 till September Expiry? You are here: Home / Futures and Options / Will Nifty Sustain above 8000 till September Expiry? Surprisingly Mutual funds are the Net buyers consecutively for the last four months and had pumped a net inflow of closely 15464.5 crores right from May 2014 month onwards. It seems mutual funds are Interested in the markets after general elections. Last week ECB has cut the rate at which banks can borrow from the central bank from 0.15 to 0.05% which likely to attract more inflows into our market. Nifty and Bank Nifty futures manages the positional buy mode and currently the support zone comes around 8061 and 15864 respectively. Strategy has to be reversed to positional sell mode if the support breaks on the hourly charts. India VIX closed below sub 13 levels and maintains the positional sell mode for a prolong period which indicates there is a lack of panic in the market. Currently the resistance zone comes close to 14.90. One can expect sharp volatility in nifty is India VIX closes above 14.90 on the hourly charts. 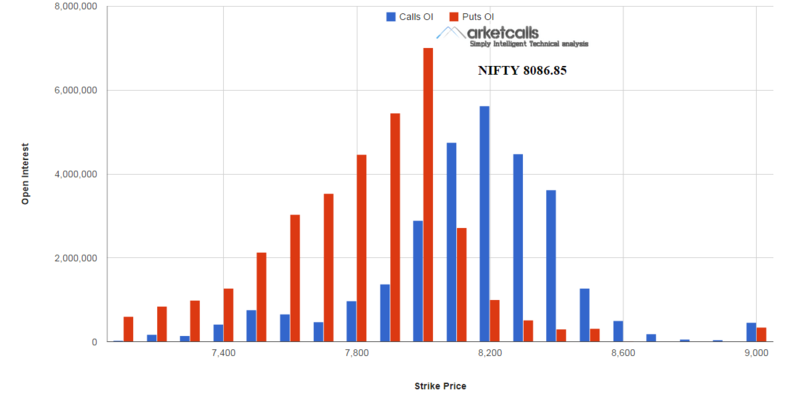 So far 8000CE writers are the active call writers for the current series and Option writers strongly believe that 8000 will be protected in the lower side. Industrial production figures for July would be released on Friday. Data for inflation based on combined consumer price index (CPI) would also be announced on the same day. how does PA can be done by tape reading? waht is tape reading basically?do we need any l2 data for that?